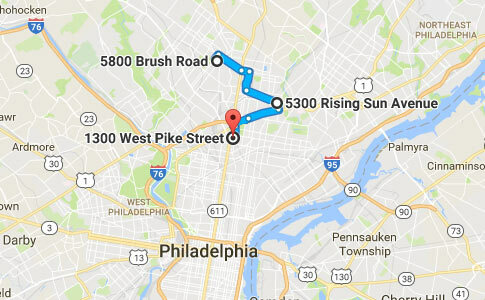 Locations of three violent pit bull attacks in North Philadelphia since January. Philadelphia, PA - A man is dead after being attacked by four pit bulls on Thanksgiving Day in the Hunting Park section of North Philadelphia. The attack occurred just before 9 pm in the 1300 block of West Pike Street in the backyard of a home. Police shot and killed one of the pit bulls; the others fled back into the owner's home. The unidentified man was transported to Temple University Hospital with critical injuries, reports WPVI-TV. He was pronounced dead at 10:18 pm. Police Chief Inspector Scott Small told NBC10, "He was covered in dirt and mud. So, they couldn't even tell or estimate his age at this time." Janet Walke, who lives nearby, said that just moments earlier she had given the man a plate of food. "I just fed him. I gave him a plate of food," she said. Though it remains unclear why the victim was in the pit bull owner's backyard, police said the victim knew the dogs' owner. Police suspect a medical condition contributed to the man's death. This attack mirrors the February 25 attack in the Olney section of Philadelphia just a few miles away. Police responded to a call of a vicious dog in the 5300 block of Rising Sun Avenue. When officers arrived, they found a 21-year old man unresponsive in his apartment with bite injuries to his face. The victim's 8-month old pit bull was found in the room covered in blood. The man was taken to Einstein Medical Center where he was pronounced dead less than an hour later. The male victim was never identified. Police suspected he suffered a "medical trauma" as well. The cause of death was never released. A month earlier, in the Germantown section of North Philadelphia, also just a few miles away, an unidentified 96-year old woman apparently survived a vicious attack by two pit bulls. Police said the woman was found unresponsive with dog bite injuries to her face, head, neck and arms in the 5800 block of Brush Road. She was taken to Einstein Medical Center in "extremely critical condition," news reports state. Witnesses said the side of her face was left "unrecognizable." Regarding the most recent attack, police shot and killed one of the pit bulls, which indicates the dogs were actively attacking the man. Being found "covered in dirt and mud" is not uncommon after a vicious dog mauling, particularly when it involves multiple dogs. Studies in medical journals consistently report wounds heavily contaminated with dirt, gravel and debris. The dogs pull the victim to the ground and physically drag them through the dirt while biting and tearing off flesh. Watch the surviving pit bulls get pimped out by the local SPCAs. And this isn't just a Philadelphia problem. The Delaware and Chester County SPCAs are also infested with pit pushers. It really urks me when the cops/press opine that a possible medical condition caused/contributed to a PBRF. They also imply that the deceased is homeless and has a life worth less than other people so "oh well." The victim deserves to have his name known and justice to be served whether he was trespassing or not. It was reported that the victim knew the owner of the pit bulls so rather than trespassing wasn't he likely just visiting? Yes. He may have known the dogs too! Since he knew their owner. No one should be allowed to own FOUR pit bulls because no one can control four pit bulls. If your dog(s) kill someone you should absolutely be charged.